"Crushed Like A Car" might be his most honeyed, melancholy midtempo sigh yet, buoying his sweet-sad voice gently aloft." - Pitchfork "The playing's always spirited, producer Adam Lasus lends the disc a warm, ingratiating sound, and the songs are both taut and well-considered in their arrangements.” - Pitchfork “Pure pop for now people” – SPIN, 8 out of 10 “A feel-bad record you can actually feel good about.” – SPIN, 8 out of 10 “in the grand power-pop traditions of Shoes, Material Issue and the Fountains of Wayne, wallowing here is delivered with buoyancy.” – LA Times "A poisoned Valentine dripping with equal parts beauty and scorn; imagine a Vulcan mind-meld between Teenage Fanclub's Bandwagonesque and Marvin Gaye's Here, My Dear and you're there. ""- eMusic “The Last Place” (The Fever Zone), solidifies Kennedy’s credentials as a pop-rock aficionado who aspires to write chiming, guitar-stoked melodies in the mold of prime Badfinger, Teenage Fanclub and Shoes.” – Chicago Tribune, 3 out of 4 “Bounding jangle-pop guided by Kennedy’s plaintive, searching vocals” - Rolling Stone "If you loved the shimmering guitars and hooks-for-days approach of the band’s debut, you’ll find even more to love here: angelic choruses, pristine hooks and heartsick lyrics, all making for the absolute ideal summer record. 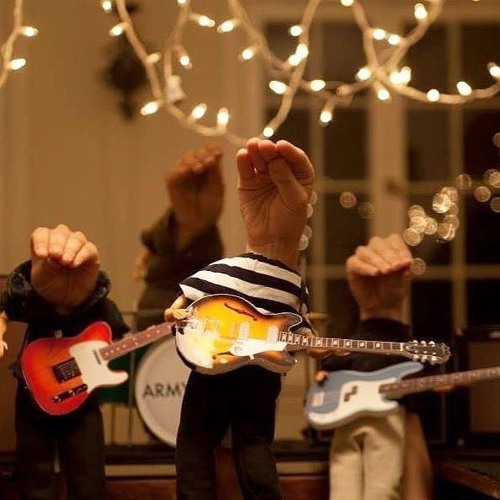 "- eMusic Los Angeles-based indie-pop band Army Navy are excited to announce their brand new full length album titled The Wilderness Inside. Produced by longtime friend and notable producer Adam Lasus at Fireproof Recording, The Wilderness Inside expands on the band’s signature, sparkling guitar-driven power-pop complimented by frontman Justin Kennedy’s wounded lyrics. As with the band’s previous albums, The Wilderness Inside will be released on the band’s own The Fever Zone Records on Tuesday, July 15. Check out the premiere of “The Mistakes” from the new album over at Wondering Sound HERE. Army Navy released its highly acclaimed self-titled debut full-length on their own label, The Fever Zone, in late 2008, an album Pitchfork declared a "bubbly effervescent valentine to obscure power pop bands of the late-1970s and early-'80s" in their 7.8 review, and what NPR described as "a Posies-and-Teenage Fanclub-style tsunami of melody and distortion that underscores the youthful essence of power-pop in all its bittersweet glory." In June 2011, the band released their sophomore album titled The Last Place via eMusic’s “Selects” program, a coveted spotlight that featured and offered The Last Place to eMusic.com’s subscribers exclusively for an entire month. During its exclusivity, eMusic went on to describe The Last Place as “a poisoned Valentine dripping with equal parts beauty and scorn; imagine a Vulcan mind-meld between Teenage Fanclub’s Bandwagonesque and Marvin Gaye’s Here, My Dear and you’re there.” SPIN went on to call The Last Place “a feel-bad record you can actually feel good about” in their 8-out-of-10 album review. Since the release of The Last Place, Army Navy has been touring both coasts of the U.S., sharing the stage with bands such as Someone Still Loves You Boris Yeltsin, The Features and others. With the upcoming release of The Wilderness Inside, Army Navy will be making more live appearances throughout 2014. Tour dates to be announced soon.